As young people in Delaware report more and more signs of mental health issues, their options for dedicated help and support remain slim. Rodel and a team of researchers just conducted a statewide landscape analysis of social and emotional learning (SEL) in Delaware. The report highlights promising practices and areas for potential growth as state leaders and educators look to serve all Delaware students in a more holistic way, with greater emphasis on their mental and emotional wellbeing to ensure they grow into healthy, productive, citizens. A clear area for improvement: supporting students’ mental health needs. 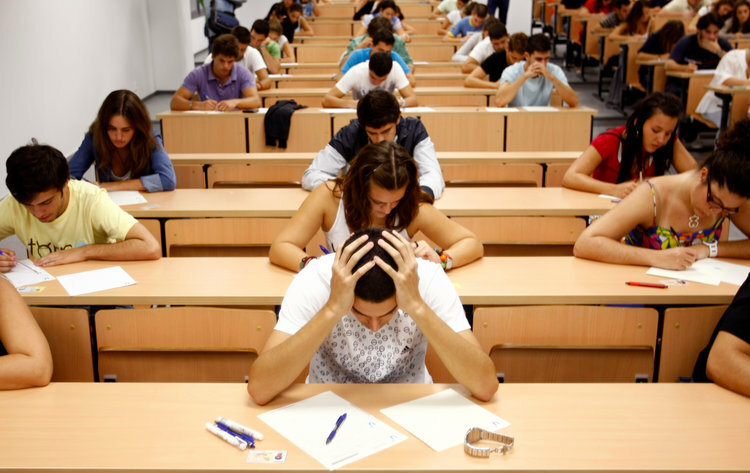 The need is particularly acute for students with severe mental health needs, who often require specialized care. Delaware has only one mental health facility statewide—MeadowWood—that admits adolescents for residential treatment. And whenever the facility is at capacity, new patients need to find another provider for their treatment, meaning families occasionally must make the difficult choice to send their child out-of-state for treatment. Students who don’t feel safe at school often experience challenges with attendance, academics and mental health. Safe, supportive school environments, where students have positive relationships with peers and adults and feel a true sense of belonging, strengthen student engagement. 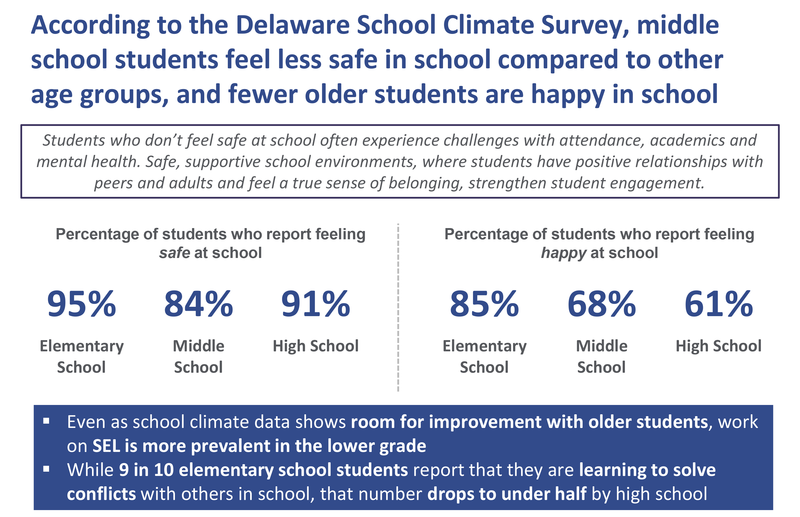 In Delaware around 85 percent of elementary school students report feeling happy at school, while only 61 percent of high schoolers did, according to the Delaware School Climate Survey. Meanwhile, 23 percent of Delaware children have experienced two or more Adverse Childhood Experiences (or ACEs) that include physical, sexual, or emotional abuse or neglect, substance misuse or violence in the household, parental divorce, among others. But these statistics are counterbalanced by promising emerging evidence that indicates students with stronger SEL skills are more likely to have positive long-term life outcomes, including staying out of jail, avoiding substance abuse, and having stronger mental health. So, how can Delaware ensure that all our kids have access to the supports they need to develop their SEL skills? There are many partners in Delaware already working to support this work, but one finding of our research study found that addressing these issues will require deeper collaboration between schools and other community partners. Thankfully, there are some strong examples of school and community partnership underway in Delaware. The Partnership for Resilience, a collaborative of education and healthcare partners in Illinois, aims to integrate health, education, and community partners to support the whole child. They build sustainable community partnerships; create resources, trainings, and education programs; and advocate for research-based policies that further their mission. Every student in kindergarten through eighth grade in Salem, Massachusetts has an individual success plan, which weaves in-school and out-of-school strategies to support the needs and goals of each student. A partnership between DC Prep and Children’s National Hospital in Washington, D.C. has set up a mental health center directly within two schools, bringing a multi-disciplinary team of mental health professionals to provide a wide range of services. These examples and promising practices from across Delaware and the country offer insights into how to best serve students and families and how our community partners and schools can continue to work together.